The North Germanic languages are a group of languages that together form a branch of the Germanic languages. 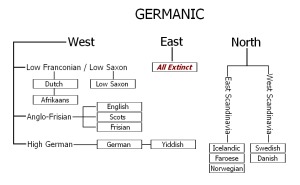 There are three branches of Germanic languages, though one branch, the East Germanic languages, no longer exists. The other branch is the West Germanic languages, which includes German, Dutch, and Afrikaans as well as other languages. You will find that most Nordic countries have a North Germanic language as their official language. The Nordic countries are Denmark, Sweden, Norway, Finland, and Iceland. Sometimes Greenland and the Faroe Islands are grouped in with the Nordic countries, but they generally don’t use North Germanic languages there. This could be a bit confusing, as I’ve just told you that they are called the North Germanic languages. However, it might help you to remember that, in most of the Nordic countries, North Germanic languages are spoken. The reason why they are sometimes called the Nordic languages is because Nordic (or a translation of it) is a common word found in Swedish, Norwegian, and Danish. However, this may not be the most accurate way to describe these languages as a group, as we know that Icelandic and Faroese (from the Faroe Islands) also form part of the North Germanic languages. It’s still important to know that some people may use the terms Nordic and North Germanic interchangeably when talking about this particular group of languages. 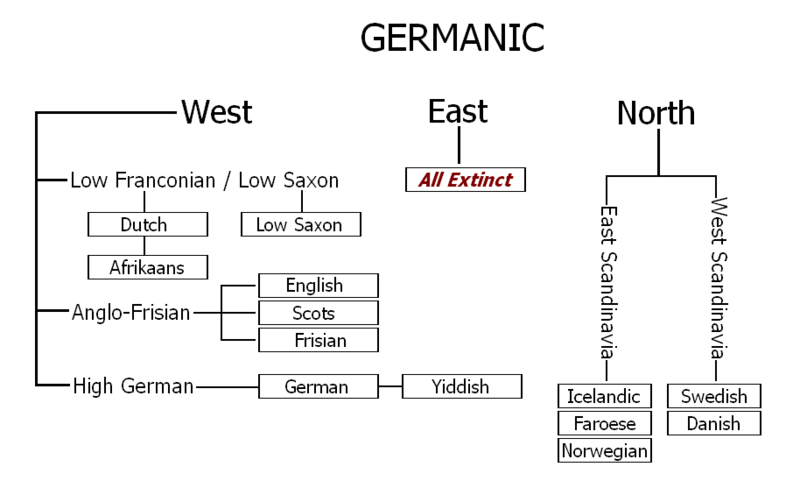 There are many morphological and phonological similarities between the West Germanic languages and the North Germanic languages, probably due to the way the evolved. At first, before the year 200 AD, all of the Germanic languages were more or less mutually intelligible and very similar. After 200 AD, the North Germanic languages started to evolve more and started to distinguish themselves as different from the rest of the Germanic languages. However, they retained a lot of characteristics that all Germanic languages shared at one point, such as the use of the i-umlaut (also known as the Germanic umlaut). Another shared characteristic is the development and use of what would become the demonstrative pronoun “this” in English. The languages that form the Scandinavian language group are Norwegian, Swedish, and Danish. They are spoken in all of the three Scandinavian countries of Sweden, Norway, and Denmark, hence the name of the language group. Some people may say that the North Germanic languages and the Scandinavian languages are the same, but this isn’t true. Since Scandinavia is made up of the three previously mentioned countries, it makes more sense that the Scandinavian languages would also be the official languages of Norway, Sweden, and Denmark. If someone gets this wrong, though, be patient because the North Germanic languages are notoriously hard to classify, and maybe they just read about an older way of classifying them. You probably noticed that I haven’t mentioned Finnish yet as one of the North Germanic languages, and that’s because it’s actually not a Germanic language at all. It may seem weird, but the truth is Finland isn’t even a part of Scandinavia technically, which doesn’t necessarily mean that Finnish isn’t a North Germanic language, but it is the first clue. Finnish is a Finnic language of the Uralic language group, which includes Hungarian and Estonian. This means that Finnish is more related to Hungarian or Estonian than Swedish or any other North Germanic language. If you think about it, it makes sense because Finland is very close geographically to Estonia. It’s close to Sweden too, but may share more culture with Estonia than with Sweden and thus a language family as well. Having said that Finland is generally not a country where North Germanic languages are spoken, and that Finnish is actually a Uralic language, it is also true that there is a Swedish-speaking population in Finland. Speakers of Swedish are generally found in areas of Finland that are closer to Sweden, and they make up about 5% of the population of Finland. They speak a particular dialect of Swedish known as Finland Swedish, which is mutually intelligible with other Swedish dialects. Those who speak Swedish in Finland as their native tongue are considered a unique ethnic group in Finland, though they are still considered to be Finns. The two official languages of Finland are Finnish and Swedish, though many more people speak Finnish than Finland Swedish. Though Greenland is sometimes grouped in with the rest of the Nordic countries, it technically is not one of them. The main language of Greenland, Greenlandic, and its dialects, are actually Eskimo-Aleut languages and are closely related to Inuit. The main dialect of Greenlandic is called Kalaallisut or West Greenlandic, and is considered the official language of Greenland. However, it’s not the only language spoken in Greenland. For a very long time, Greenland was part of Denmark-Norway, and later on became a Danish colony. This means that many people in Greenland speak Danish at least as a second language. Some speak it as a native language as well, usually government workers and people of mixed Danish and Inuit ancestry. It may sound crazy, since anyone who’s ever studied the history of the English language will say that it is most definitely a West Germanic language, along with Dutch, German, and Afrikaans. However, a couple of Norwegian language professors did some digging and found that Middle English is very likely a mix of Old English and some Scandinavian languages. Since Modern English is a direct descendant of Middle English, that would make Modern English a Scandinavian, and therefore North Germanic, language. There is other evidence, such as shared vocabulary and grammar, and also the fact that the syntax of Scandinavian languages is more similar to that of English than other West Germanic languages. This would all explain why it is so easy for speakers of other North Germanic languages to learn and speak English. The Scandinavian languages are probably the most well-known of the North Germanic languages, and they are also the most mutually intelligible. However, it tends to be a bit one-sided. For example, Norwegian speakers are the best at understanding Swedish and Danish, while Swedish people have more issues understanding Danish. This could be due to the fact that Danish and Norwegian are more closely related than Swedish and the other Scandinavian languages. Even with these discrepancies, some linguists have proposed that there is really only one Scandinavian language, Scandinavian, and that Danish, Norwegian and Swedish function as dialects of that language. They are very similar and mostly mutually intelligible, but political borders prevent them from being viewed as dialects of the same language. Though Icelandic and Swedish may be quite different, they (and all other North Germanic languages) share a common ancestor: Old Norse. Old Norse is the language that was spoken by the people who lived in what is now Scandinavia, and the other areas settled by them, from the 9th to the 13th centuries approximately. It could be further divided into three main dialects: Old West Norse, Old East Norse, and Old Gutnish. There weren’t really any clear boundaries in terms of geography for the dialects, meaning that you could find characteristics of each one in different areas. It is thought that Old Norse started developing into the North Germanic languages sometime in the 14th century, though there are records of written Old Norse from the 15th century. The controversy has gone on for a long time, but it has its roots in the fact that Norway was under Danish rule for about four centuries. This led to Danish being the official language in Norway for some time, and Danish was the written language of Norway during the time of Danish rule. The city dwelling upper class of Norway spoke a type of Danish that had Norwegian pronunciation rules, called Dano-Norwegian. Eventually, this became one of the official languages of Norway, evolving into the Norwegian dialect known as Bokmål. The other Norwegian written language is called Nynorsk and is based on Norwegian dialects, but it is not as accepted as Bokmål, as it could be seen as opposing the Danish influenced Bokmål. While it is true that the Finnish language is more related to Estonian and Hungarian, the culture is absolutley not. Finland is a Nordic country that is culturally very similar to Sweden and Norway, and was a fully integrated part of Sweden for 700 years. Thus the culture is Nordic, even though the language is Finnic (Uralic). Finnish is also spoken as the native language of large minorities in Sween and Norway. « Is English a Scandinavian Language?